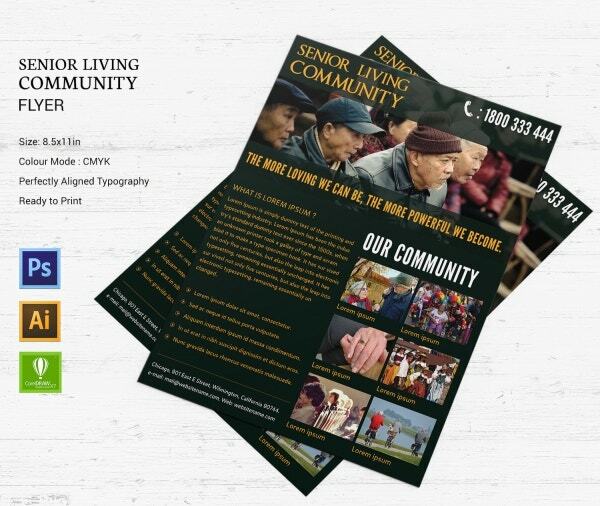 These senior living community templates have been designed specifically for such organizations trying to advertise their services. Here, you would be spoilt for choice since you’ll be getting both bi-fold and tri-fold brochures, posters, postcards, banner ads, billboards and so on. It is entirely up to you what medium you want to choose. All of the templates that you see here are fully editable and the designs have been created with utmost care to meet your demands. 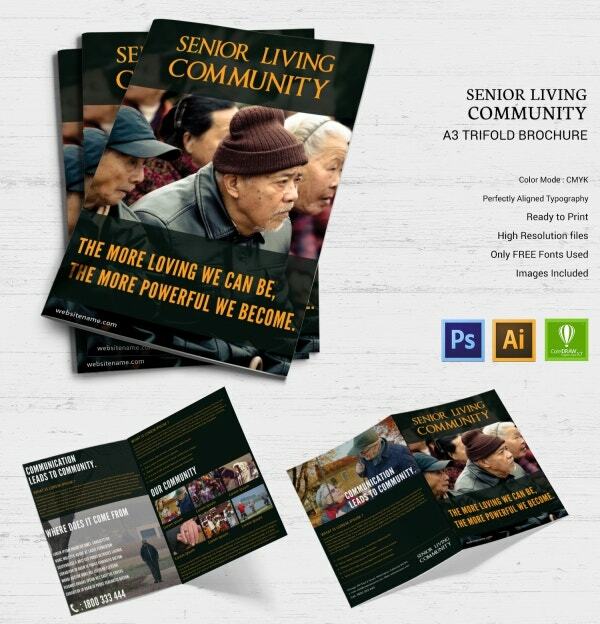 A tri-fold brochure would give you ample space to fill in all the details about your senior living community without making it look clumsy. Also, the black background certainly makes the template look all the more stylish and attractive. Here, you would be getting the layered file and a fairly high resolution of 300 dpi. 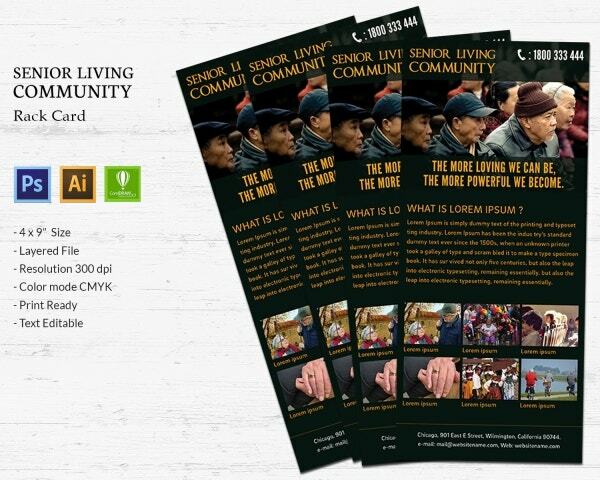 In case you’re planning to hand out pamphlets or brochures about a senior living community, then you could use this template to do so. The template begins with an image and a catchy headline as well. Here, the color mode used is CMYK. It also comes with perfectly aligned typography and high-resolution files. The template is also all set for printing. With this template, you will be getting five banner ads to choose from. Each banner ad in the template comes in a different size and that means, you would be able to use them for a variety of purposes. All the banner ads that you see here are fully editable and customizable as well and come in a layered file. 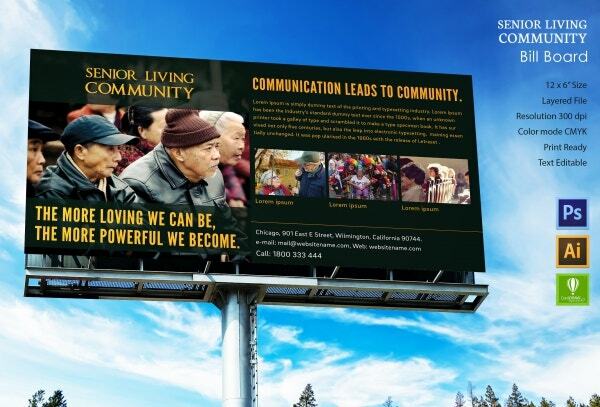 If you’re advertising for senior living communities on billboards, then you need to make sure that they are catchy enough. At least, that’s one thing you do not have to worry about with this template. Here, you would be getting a high-resolution file in a layered format. You would also be getting a template that is really easy to use and edit. 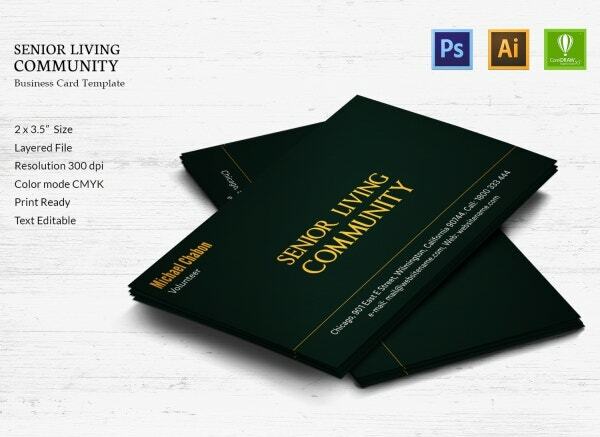 In case you’re planning to develop personalized cards for your senior living community, then you could take the help of this template. The size used here, that is 2 x 3.5-inch, is a standard size and that makes it convenient. Also, you would be getting the template in a layered file and it uses a fairly high-resolution for the images. Also, the template is all set to be printed. Planning to design your own cover page for an eBook? Then you really cannot afford to miss out on this template here. It comes in an A4 size format and in a layered file. Also, the images you see here have a resolution of 300 dpi. The best part is, each textual content on the template is fully editable and can be customized. Plus, it has been kept ready for printing. 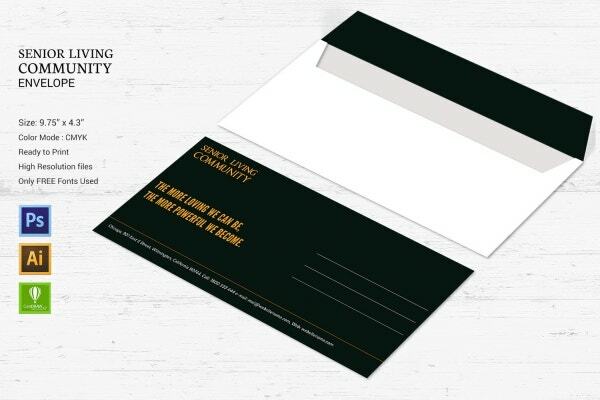 The sleek black envelope provided in the template is sure to impress you. It would certainly leave a lasting impression on the minds of the recipients. The envelope that you get in the template has a standard size of 9.75 x 4.3-inch and it comes in a layered file. The template is absolutely ready to be printed. 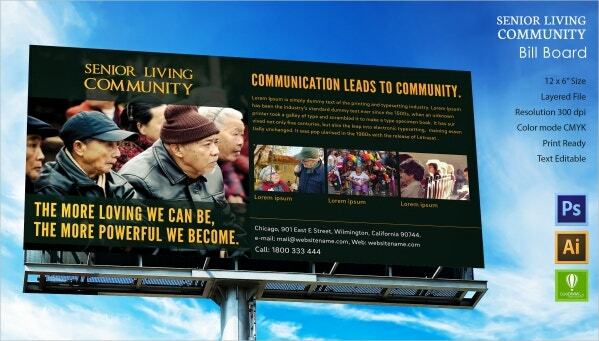 In case you’re planning to advertise your senior living community, you could use a flyer to do so. A flyer like this would allow you to incorporate all your details in an organized manner without making it look clumsy. Also, you would be getting a template having perfectly aligned typography, which makes it attractive. 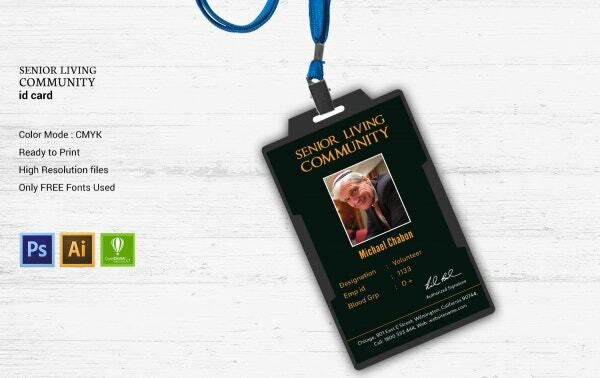 An ID card is a must for any institution like a senior living community. 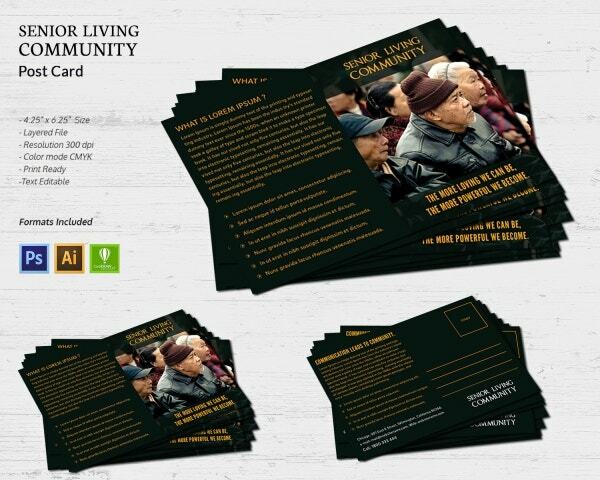 If that’s what you’re planning to create, you can take the help of this ID card template. It uses a color mode of CMYK and it comes in a layered file. You would be getting high-resolution files as part of your package. Also, the best part is, the text here is fully editable. That means you would be able to customize the details and add your own. 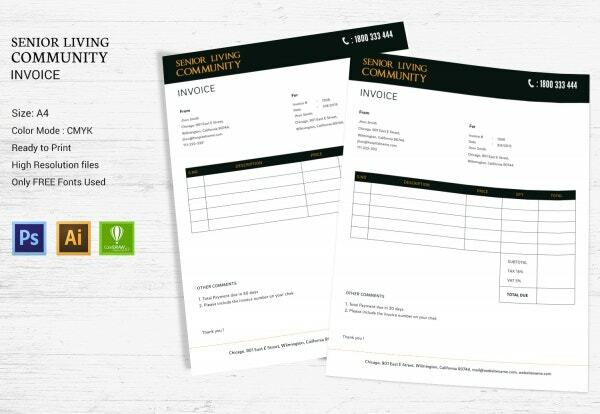 Creating an invoice for a senior living community can be a tedious and tiresome task unless of course, you use this template. This template here already contains the right format for an invoice and thus you wouldn’t have to worry about that. All you will have to do is download the template and then customize the template to add in your essential details. 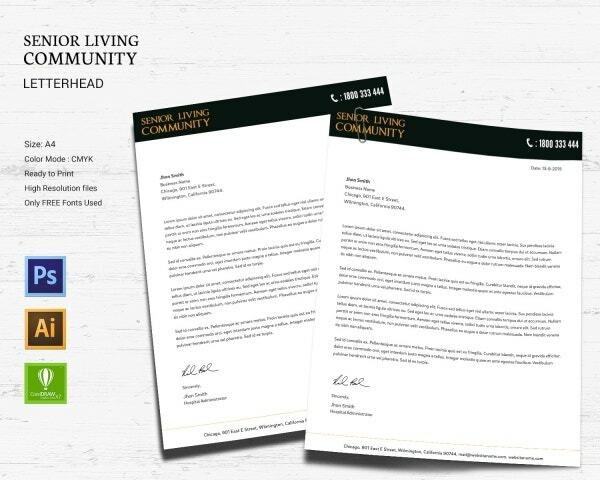 A letterhead needs to be formal and official in nature. Well, that is exactly what this template demonstrates. The template here has been kept as simple and professional as possible. Also, you get the template in a layered file and in high resolutions. You would also be getting a color mode of CMYK and the template is really easy to edit. As you can see in this template, it focuses more on the text than on the images. That makes the template look all the more informative. However, the template here is fully editable. That means, once you download it, you will be able to customize the details provided here and add your own. You would also be getting the images provided here. 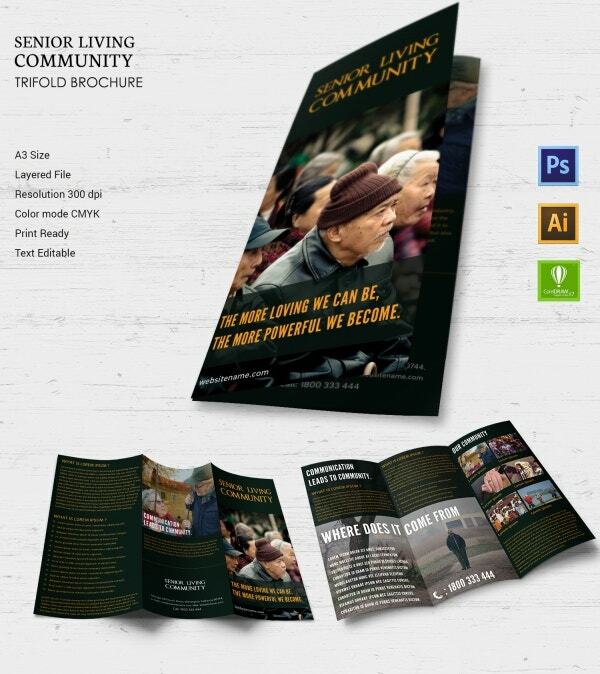 If you download this template, you would be getting a poster template that can be customized according to your needs. 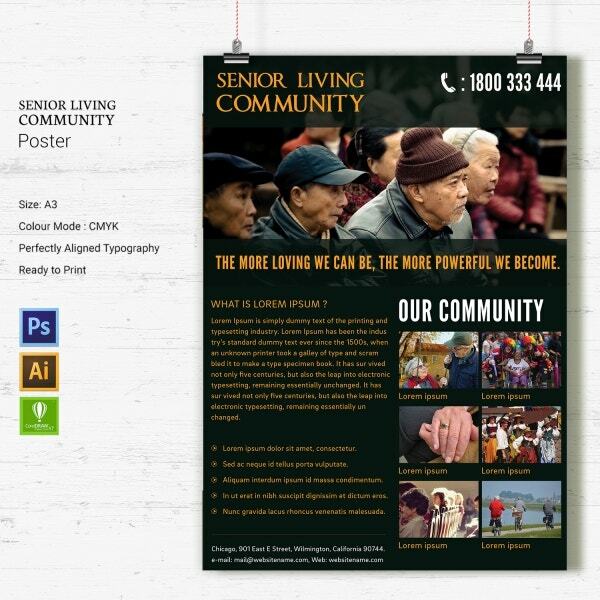 The poster template also comes with an attractive headline and stunning images, all of which you can make use of. Also, the template has been made ready for printing and you would be able to print it as soon as you’re done editing. The rack card here resembles a pamphlet or brochure in many ways. 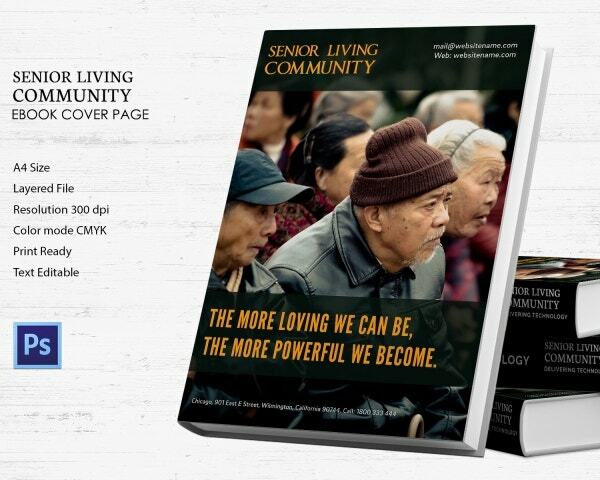 Here, you would be able to list all the key details and facilities of your senior living community. You would also be able to include appropriate images in the template to make it look all the more attractive. Also, the template here is fully customizable and easy to edit and print. 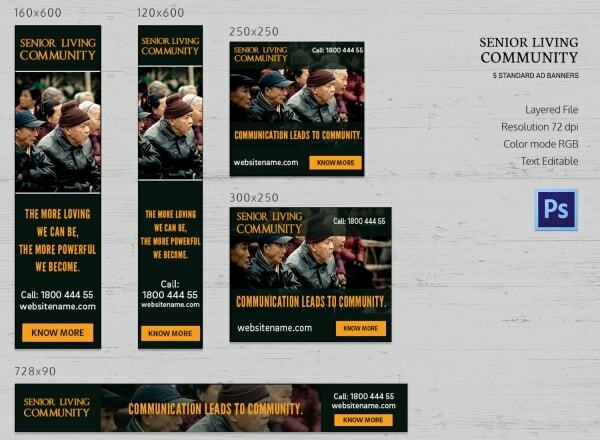 In case you’re planning to advertise your senior living community through social media, you could do the same with the help of this template. Here, you would be able to design three cover pages, each for a different social media platform – Facebook, YouTube, and Twitter. You would be able to organize and edit the text on the cover page as you please.